Established in well-loved tourist areas, Oléla campsites benefit from privileged geographical locations, which will enable you to enjoy a variety of activities during your stay. Disneyland® Paris, Asterix®, Puy du Fou® and Futuroscope® – holiday near the most famous theme parks in France! Discover our favourite destinations in the Vendée and enjoy the beauty of the coast! Hiking, kayaking, exploring châteaux – all this awaits you during your stay at one of our campsites in the Dordogne. Île de Ré or Île d'Oleron? Discover these two incomparably delightful islands! 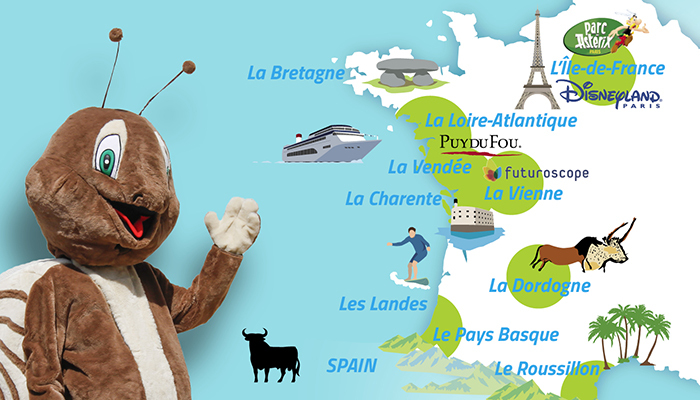 Pornichet, La Baule, Guérande – there are lots of lovely tourist sites to discover near our campsites in Loire-Atlantique! How do you feel about a camping holiday close to the Mediterranean and Spain? Get your fill of activities and thrills on land or at sea while staying in one of our campsites in the Landes!